Custom Drum Handling Equipment Archives - Liftomatic™ Material Handling Inc.
Liftomatic has a long history of contributing helpful information to Industrial Equipment News (IEN). We recently published a new whitepaper which provides helpful guidelines for selecting the correct drum handling equipment for your desired applications. You can find the full whitepaper on IEN, titled Essential Guide to Choosing Drum Handling Equipment. Here, we’ve provided a quick breakdown of the information that was so thoroughly addressed by our Application Specialist, Keith Carmody. Assess your goals and challenges – For example, if your goal is to prevent drum damage, consider using padded equipment. 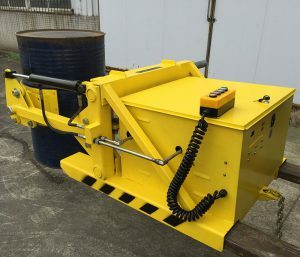 If you want to improve throughput and inventory turns, you may benefit from a drum handler that can pick up multiple drums at time. The first step is figuring out the areas that need improvement, and then looking into which products can best help you meet those goals. Consider your operators – Not every person on your team will be able to effectively use each piece of equipment. Take an inventory of your staff, look at each person’s strengths and weaknesses, and then assign the equipment based on those factors. Also take into account hours worked, since lack of sleep combined with heavy equipment can have disastrous consequences. Reassess your operations – Just as each person may be best suited to a different task, the same goes for equipment. Maybe you’ve been using the same products for the last decade, but have since changed other parts of your processing chain. This is a good time to review new products and see if any of them will be a better match for your needs. 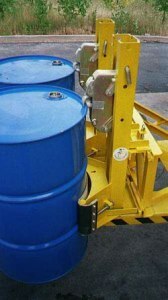 Occasionally, custom drum handling equipment is needed to address all requirements. Consider materials being handled – 55-gallon drums can contain a number of different products, but one of the most well-known examples is oil. This material is highly flammable and explosive, and many other products have similarly hazardous characteristics. Always make sure operators are aware of which materials are being transported and what safety precautions are necessary. Some items will require specialized drum handling equipment to ensure safety. Review the safety of your entire facility – Having trained workers and the correct equipment is your first line of defense against workplace accidents. Make sure the facility itself is also in line with safety recommendations. This means having proper signage in all necessary areas, looking out for blind spots on the warehouse floor, and providing regular maintenance on all equipment. Hopefully the above information has been helpful in choosing the right drum handling equipment and ensuring the safety of your facility. The original whitepaper can be found at IEN for reference. In addition, this is the first in a 2-part series on selecting drum handling equipment. Stay on the look-out for our complementary second feature!